Got Craft will be hosting a mini market as part of Canzine West featuring Bliss in a Teacup, Firefly Notes, It's Your Life Handmade, Sam Made, a Cagey Bee, pomo mama designs, Irit Sorokin Designs, Thistle Town Studio, Sam Bradd Designs, Love Bobbie, Civil Disobedience, Open to Chance Designs, Locomotive Clothing Co. and Hand + Shadow! Interested in attending? We have a pair of tickets to giveaway! All you need to do is send us an email to info(at)gotcraft(dot)com with your full name and phone number. Contest closes Thursday, October 14th, 2010 at Noon (PST). 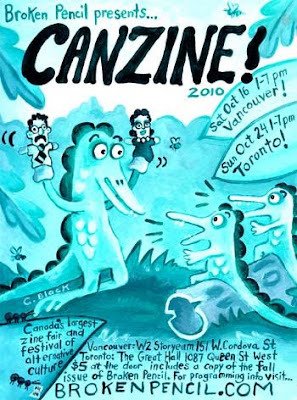 Canzine West is a Zine Fair and Festival of Alternative Culture, with a focus on indie publishing. Guests can peruse zines, magazines, books, art, crafts, and can listen to readings, watch poetry collide with improv comedy, view art exhibits and installations, create art with Collage Collage, buy handmade goods at the Got Craft mini market, watch indie film shorts, pick through vintage treasures, and more. Saturday, October 16th, 2010 from 1:00 p.m. to 7:00 p.m.